Back when Supermono released EpicWin [$2.99], its to-do list RPG, we spent some time contemplating whether adding game mechanics to productivity apps would really help people be more productive. That’s the question that rests at the heart of all discussions about “gamification"—do carefully tuned game mechanics drive us to perform tasks we might otherwise ignore? Has Farmville claimed so many man-hours because it’s fun, or because it’s designed to feed on impulses that could be better used for good? Don’t count it as a blow against gamification, but, personally, EpicWin never quite clicked. I found the experience bars and loot rewards intriguing, but the work I had to put into maintaining my tasks outweighed the benefits. More recently I’ve found myself back in the world of gamified productivity with the help of a to-do app that doesn’t look game-like on the surface at all: Realmac Software’s Clear [99¢]. Beneath all its lovely minimalistic design you’ll find the potential for a compelling game experience. With today’s update, Clear realizes some of that potential—and it brings a few easter eggs for the discerning iOS gamer along for the ride. Clear launched with a bang, thanks to plenty of well-placed hype. Reviews at the time noted the simplicity of its design asthetic, the elegance of its colors. 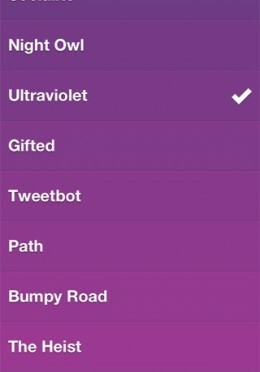 Those colors were customizable with a few built in theme options. Within a few hours of release, though, buzz started to build around secret unlockable themes people were finding tucked away in the app. If you’ve ever felt the urge to master a game, to earn 100% completion on something, you might understand the effect that had on me. At first I only hoped to unlock a theme that was a little different because I wasn’t too fond of the baked in options. Then I had to have them all. The first two were easy—and I’m about to get into details, so stop reading and just grab the update if you want to go in unspoiled— one is unlocked for having Tweetbot [$2.99] installed. 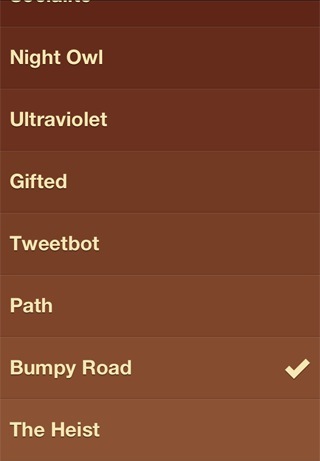 Another, Scorched, opens up if you follow any of the app’s creators on Twitter through the app’s menu. The third is the one that made me realize gamification could work for me. The Socialite theme is unlocked by completing 100 tasks and then posting about it online. As soon as I heard that I starting using Clear obsessively. I added every important deadline, chore and errand and diligently checked them off. By the time I hit 100, I’d formed a habit. Sure, I unlocked the theme I’d been waiting for, but I also found myself more organized for it. Then there was the letdown: with nothing left to unlock, Clear went back to being a pretty little to-do app that was great to use but not particularly game-like. Today’s update brings a return to that early entertainment with seven new themes to discover. Three of the themes mirror the original set. There’s a shameless self-promotion option, which rewards you with a theme for gifting Clear when prompted. It’s called “Gifted." 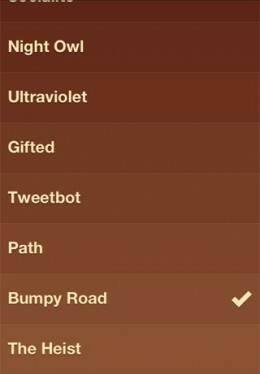 The Path theme is a reward for having Path [Free] installed, just like the theme for using Tweetbot. And then there’s the self-improvement theme: Ultraviolet unlocks when you use the app each day for 7 days straight. There’s a fundamental rule of any productivity system: you have to actually use it for it to do any good. Ultraviolet could provide that little tick of motivation someone like me would need to keep up the effort that requires, just like achievements might make you play a game longer than you might otherwise intend. There’s also a fourth unlockable theme, Night Owl, that encourages you to be productive after dark, between 12 and 3 a.m.
Now here’s the cool part, the part that reveals Clear’s affinity for games. Today’s update has within it the seeds of three other unlocks. Each one ties into a game: The Heist [$2.99], Temple Run [Free] and Bumpy Road [$2.99]. Those games will need to update before this works (The Heist’s update should come mid-week, and the others are on the way), but once they do we’ll get new themes in Clear for each of those games we have installed. We’re pretty fond of all three of the games—hit the links to read our reviews—and any of them would be well worth the download with or without the theme. So far, the apps that accompany Clear themes seem hand-picked for quality, and these games are definitely no different. This update also brings in a selection of fixes and features, but the best thing here is using a to-do app that really is all fun and games.